Is your Facebook timeline filled with photos containing words of inspiration, cynicism, and humor, and you want to make your own? With the incredible and free Tiny Post iPhone and iPod Touch app you can make captioned photos to share with your existing social networks and develop a new social network devoted to Tiny Post photos. The witty, bright, and informative tutorial is followed by a couple of minutes to complete the registration process and create your Tiny Post iOS app social network. You can sign in with Facebook, Twitter, or email. If you sign in with a social network, you are required to provide your email and select whether or not to follow the Tiny Post iOS app team. Like the Pinterest registration process, your existing social network contacts are scoured and suggested for you to follow. It also suggests existing users to follow, so your feed is immediately filled. Your Tiny Post iPhone app social network feed incorporates the best navigation tools of Path, Facebook, and Pinterest. The top menu bar has an icon at the upper left hand corner that opens a sliding left menu bar like Facebook. The Tiny Post iPhone app feed has the strong visual presence of Pinterest with the emphasis on the captioned photo, likes, comments, and one-touch sharing functionality. To create your own captioned photo, you touch the camera icon residing in the lower left hand corner like the navigation button of Path. You use responsive, intuitive gesture controls and touches to scroll through the feed, access the menu bar, and the camera. Your visual experience is free of superfluous icons and navigation tools. The feed’s emphasis on clarity and users’ content is a direct result of the thoughtful, smart functionality incorporated by the Beeem Inc. development team. 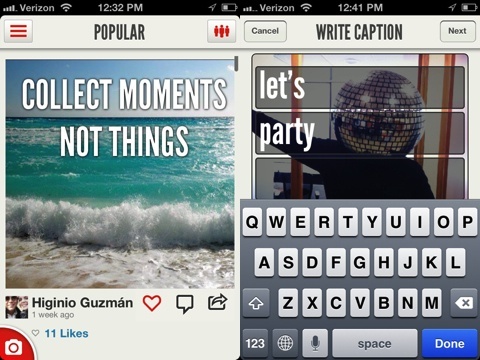 To create a captioned photo, you shoot a photo from within the Tiny Post iPhone app or select an existing photo. You have a chance to move and scale. Then, you add text in three bars. It’s quick and simple to add the text, so your ironic quip may have taken longer to formulate than the upload. The final step is the “Tag & Share” screen. You have a chance to add a caption, mark with a location, tag the photo, and tag friends. These are common operations those familiar with Instagram and Twitter photo sharing will appreciate. You highlight each social network’s icon at the bottom of the screen for sharing. You can share to Facebook, Twitter, Tumblr, and email. Beeem Inc. is campaigning for a Pinterest API, so their sharing icon is included in the sharing interface to encourage tweets to promote their cause. Or, with a touch on the lock icon, you can keep your captioned photo private. The sharing is reminiscent of the great Path sharing interface. The sliding menu bar allows you to navigate to different feeds, tags, your profile, and settings. With a touch, you can check out the most popular captioned photos and the “Hall of Tiny Fame.” The most popular tags are also available with one touch, so you don’t have to move through multiple screens to search for tags like Instagram. Your profile allows you to search for additional users to follow, and you can quickly check out your posts and likes with one touch sort buttons. Again, the profile is clean and focused on the captioned photos, so your life, perspective, and interests are gleaned by your Tiny Post iPhone app activity. The settings icon lets you adjust your sharing settings with ease. The Tiny Post iPhone app is smart, intuitive, highly functional, and refreshing. 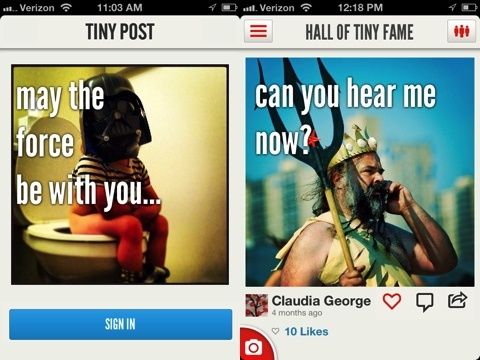 But, most importantly, the Tiny Post iPhone app deserves the Pinterest API. AppSafari review of Tiny Post was written by Jenni Ward on July 18th, 2012 and categorized under App Store, Featured, Free, Photos, Social. Page viewed 4571 times, 2 so far today. Need help on using these apps? Please read the Help Page.